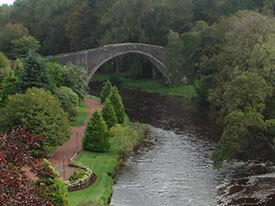 Auld Brig O' Doon near Alloway, Ayr, Scotland (13th century), the poem Tam O' Shanter by Burns made it immortal for all time. Robert Burns was of note along with many other famous Scottish people. His observations and comments are still in use today. "Many a slip between the cup and the lip" & "Auld Lang Syne" are just samples of enduring poetry that have been passed down for generations.